Are you looking for flamingo posters, screensavers, mugs? Here you'll find lots of cool flamingo stuff for you to peruse. Your kids will enjoy the coloring pages, just print them out for them. If your house is filled with flamingo birds, this is the place! Don't you just love these elegant wading birds with their long neck and legs? They are such a beautiful element of creation and deserve our protection and care. On the Yucatan Peninsula you can observe the Caribbean flamingo at Celestun Biosphere and at Rio Lagartos. Have fun coloring these funny flamingos, or paint them as you like! Among all other flamingo items I found, these AllPosters are my favorite. Their posters are digitally printed on Archival photographic paper resulting in vivid, pure color and exceptional detail that is suitable for museum or gallery display. You can choose different sizes and framing. Here's a nice flamingo pillow. 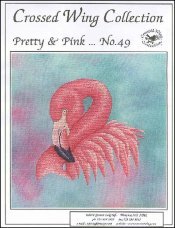 If you don't like to cross stitch yourself these flamingo canvases are little works of art.